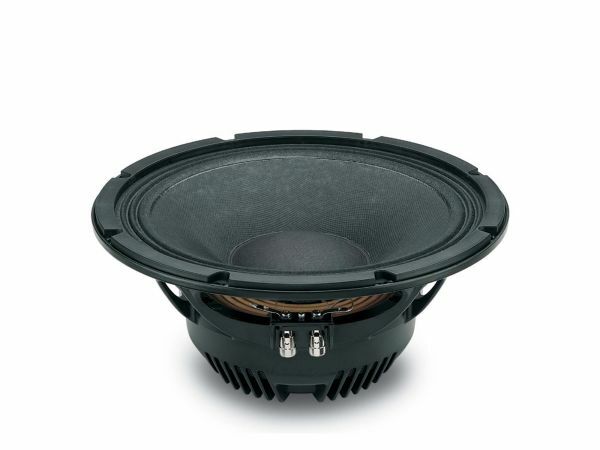 Produktinformationen "18s 12ND710 8 Ohm"
The 12ND710 has been specifically designed for use either as a midbass driver in compact 2-way reflex enclosures or as a direct radiating or horn loaded, dedicated midrange driver, in multi-way touring and fixed installation concert and arena systems. The neodymium magnet assembly assures high flux concentration, low power compression and excellent heat exchange because the external magnet configuration is considerably more efficient than traditional under-pole magnet topology. Consequently, high levels of force factor and power handling with an optimum power to weight ratio have been achieved. Direct coupling of the special design basket and magnetic assembly with the large heat sink facilitates thermal flux through the ambient air, increasing the power handling capabilities and lowering the power compression. The curvilinear paper cone has been created with a special high strength wood pulp designed to achieve the best possible linearity within its intended frequency range and to control bell-mode resonances around the cone circumference. The cone is carried by a multiroll suspension formed from a linen-like material which is more resistant to aging and fatigue than traditional materials. The already low distortion and sound quality are further improved by the use of Double Demodulating Rings technology (DDR) designed to dramatically reduce the intermodulation and harmonic distortion and improve the transient response. The 12ND710 implements Interleaved Sandwich Voice coil technology (ISV), in which an aluminum coil is wound inside and outside a high strength fiberglas former, providing a better thermal and mechanical performance than conventional coils. A proprietary humidity-block cone treatment makes the transducer suitable for outdoor use in adverse weather conditions. In addition, a special coating applied to both the top and back plates makes the 12ND710 far more resistant to the corrosive effects of salts and oxidization. Weiterführende Links zu "18s 12ND710 8 Ohm"
Kundenbewertungen für "18s 12ND710 8 Ohm"